Bihrle Applied Research Inc. and BNSF Railway successfully demonstrate automated detection, classification and reporting of infrastructure conditions found during long range UAS railway inspections. Hampton, VA, February 22, 2018 --(PR.com)-- Bihrle Applied Research (Bihrle) and BNSF Railway (BNSF) successfully demonstrated the processing of tens of thousands of images at a time covering hundreds of miles of track for the automatic detection, classification and reporting of rail conditions. This was possible using RailVisionTM – a computer vision technology solution developed by Bihrle and BNSF in support of BNSF’s UAS research initiatives. 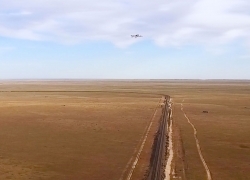 RailVision enables BNSF to automatically process images collected by drones during supplemental railway inspection flights and generates actionable reports in a fraction of the time required by traditional methods. The success of RailVision has enabled BNSF to apply its use to expanded operations beginning in 2018. Bihrle Applied Research Inc. is a leader in the aeronautical research & development community, providing engineering services and software solutions for a wide range of commercial and military applications across both domestic and international markets. Among its core capabilities is UAS services, through which Bihrle assists its customers in advancing their UAS programs and initiatives. Bihrle works closely with its customers to provide tailored solutions backed by world-class expertise in the areas of UAS vehicle development & system integration, flight dynamics assessment, operations support, modeling & simulation, regulatory assistance, flight planning software solutions, and most notably, computer vision technologies. Bihrle’s cutting edge computer vision solutions enable customers to automate the processing of large data sets of aerial imagery and apply advanced analytical methods for generating actionable results. These capabilities combine to make the commercial use of drones for asset and infrastructure inspections a practical reality. You can learn more about Bihrle at www.bihrle.com. BNSF Railway is one of North America’s leading freight transportation companies, operating approximately 32,500 route miles of track in 28 states and three Canadian provinces. BNSF is one of the top transporters of consumer goods, grain and agricultural products, low-sulfur coal, and industrial goods such as petroleum, chemicals, housing materials, food and beverages. BNSF’s shipments help feed, clothe, supply, and power American homes and businesses every day. BNSF and its employees have developed one of the most technologically advanced, and efficient railroads in the industry, working continuously to improve the value of the safety, service, energy, and environmental benefits they provide to their customers and the communities they serve. You can learn more about BNSF at www.bnsf.com. Click here to view the list of recent Press Releases from Bihrle Applied Research, Inc.